Those who know me know my Disney obsession well. It was probably what led me into the travel industry in the first place, and started at or about age 6. People simply shake their heads as I listen to Disney park music at home, read guidebooks as if they were best-selling novels, and put new editions of travelogues on reserve at the library (as if that many people were looking for them anyway). I take in Disney blogs like other read The New York Times and fill my house with assorted Disneyania including my own personal Mickey ears. If you consider a FastPass a form of payment for favors (or if you even know what that means!) you may be in my Disney dark-ride boat. If not (or like some friends you think Disney is part of the EVIL EMPIRE), here is an intro to a new series of articles. Over the next few posts, I'll try to go over some of the great things that Disney has to offer and why you might want to give it a try. Start here, read on, and see what keeps me and people like me coming back again and again. People who love Disney will tell you there is something about the place that is simply undefinable. I believe the thing that defies definition is how the ultimate in pre-packaged repeatable mass-market entertainment can create so many spontaneous and (dare I spout the word) "magical" moments. It really does seem to work that way, though. I know that my wife and I often get more nostalgic looking at those pictures of our son at Disney than any other family photos. Convincing people (especially those without kids) to take their first trip to the parks is like asking them to sit down and eat the largest brussel sprout from the county fair. There are always a million excuses and reasons why they know they won't like it. Like so many people, those who complain the loudest are those who often catch my addiction to an extreme degree. The parks, with their rides and plusses for kids and families are what most people see when they view a Disney print ad or commercial. I can actually guarantee you can go an entire trip without hugging a Princess. From the adult perspective, Disney can be just as entertaining without your little ones (or anyone elses!) You can always finish your day off at Raglan Road, one of my favorite spots. Take in a pint and some great food while the house band plays (highly recommend the Heaven on Earth baby back ribs in a Guniess and honey glaze). See a great Cirque show, or just head to the AMC for a movie. 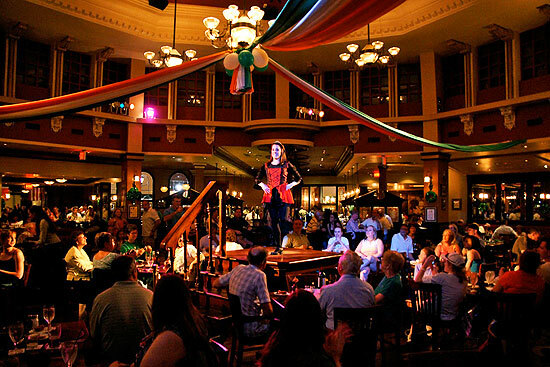 Hit Jellyrollls dueling piano bar or the ESPN Club on the Boardwalk for some after-fireworks drinks and entertainment. Fine dining is never far away either. From Jiko's African inspired flavors at the Animal Kingdom Lodge to the contemporary American cuisine at the AAA Four-Diamond Award winning Victoria and Albert's at the Grand Floridian, there is something for every palate and every occasion. Hanging by the resort can also be great. I loved getting up close and personal with wild animals on the Savannah at the Animal Kingdom Lodge, or taking a swim and sunning by the fantastic sand-bottom pool Stormalong Bay at the Beach Club.